How to make chamomile from the candy? Candy bouquets are really beautiful. But unlike fresh flowers in the bouquets can stand much longer. 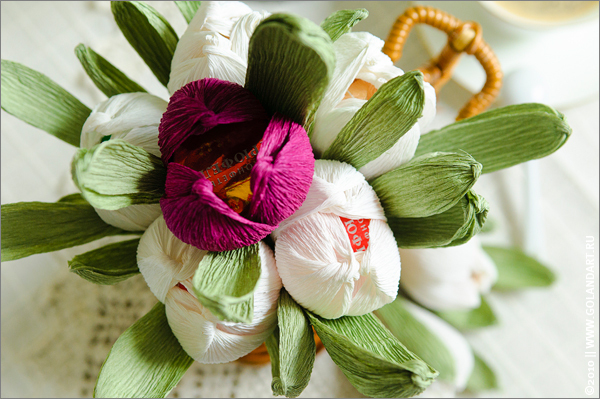 For making the beautiful bouquet you need to learn how to make flowers out of candy and crepe paper. For sweet bouquets you can use any flowers. And if banal of roses you are tired, you can try to make sweets and corrugated paper Tulip, bell and Mac. For the manufacture of a Tulip, prepare candy (preferably round or truffle type) on the number of flowers, wooden sticks, corrugated paper of green color and the desired color of the buds, glue, scissors, thread. Take the candy, wrap it with a square of paper of size 8*8 cm, in place of lay, insert a wooden stick, wrap the thread. For a single Tulip prepare three petals. To do this, cut pieces of corrugated paper desired colors size 12*5 cm, fold each in half and twist at the bending place, a rotting finger on the paper next to the twist, giving it the shape of petal. Stick turns the leaves around the circle to the flower. Can make a more fluffy tulips, adding from 1 to 3 petals. Wrap the base of the Bud green crepe paper, then repeat with a stick. Cut two long leaves and glue to the stem. To leaves was more durable, twist the two layers, like petals. For making Mac take a sweet, yellow wrap with foil as wrapped crepe paper Tulip. Attach the wand. Cut out black paper a rectangle measuring 12*10 cm, wrap around candy, tie at the base with a thread or rubber band. The upper part is cut into small strips simulating the dark core of the Mac. Prepare the red petals of poppies for the size of 7*7 cm 4 pieces for each flower. Secure them in the Bud overlap, straighten your black heart out of corrugated paper and petals. Wrap the stem with green paper, as was the case with Tulip. Fishnet cut out leaves for the flower, glue to the stem. Make as many colors of crepe paper and candy as you need for a beautiful bouquet. For a flower-bell will fit a small candy-candy. Attach the candy to the thin wire. Cut from purple paper 5 rectangles measuring 6 x 3 cm, make the ends of your corners, like the petals of a flower, the lower part is also slightly cut at the edges to give the petals a rounded shape in the centre, pushing through a corrugated paper with your finger. Tie the petals overlap to candy, attach at the base of the thread. Make 4 green leaves to Bud. to do this, cut 4 rectangles measuring 4.5*1.5 cm Cut off the excess, giving the leaves an acute form. Clip on flower. Make 3-5 flowers. Wrap the wire at the base of the green corrugated paper, connect the flowers between them, giving them the shape of the branches attach to the stem a few green leaves, wrap to the end of Hirobumi. So, you learned how to make flowers from crepe paper and candy. Now you can safely take out of them bouquets and give your family and friends.